(SPOT.ph) Elmer, a comic book by Filipino comic artist Gerry Alanguilan, won this year’s Prix Asie-ACBD award in France. The announcement was made on June 30 at the Japan Expo. The Prix Asie-ACBD is an award handed out by the Association des Critiques et des journalists de Bande Dessinee, a group of French comic critics and journalists to the best Asian comic book published in France. Alanguinan beat comic artists mostly coming from Japan for the award. 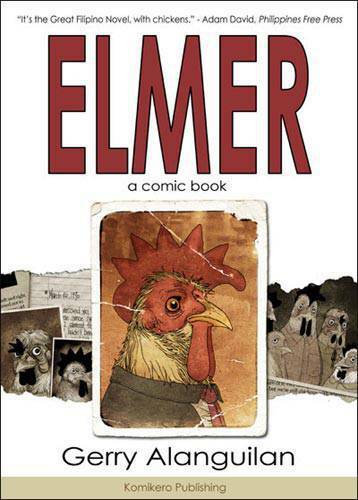 Elmer is about an alternate world where chickens are intelligent and conscious, and are pushing to be recognized as the newest members of the human race. According to Alanguilan's website, "Elmer tells the story of a family of chickens who live and struggle to survive in a suddenly complicated, dangerous and yet beautiful world." Alanguilan, who has been an inker for Marvel, DC, and Image, apart from illustrating several local comics, posted on his blog an e-mail from his publisher. "Elmer won and the journalist (who) handed me the award praised the book for a couple of minutes," stated the e-mail. His publisher, who attended the awards ceremony in Japan, said the book was chosen out of 1,500 Asian comic books published in France within the year. For more on this story, log on to Gerry Alanguilan's website. Photo from Gerry Alanguilan’s official website.